R. Schiedung, R. Darvishi Kamachali, I. Steinbach, F. Varnik. The entrenching of multiple nanoclusters α into a deformable surface β by surface and phase-boundary diffusion. The multi-phase-field approach is generalized to treat capillarity-driven diffusion parallel to the surfaces and phase boundaries, i.e., the boundaries between a condensed phase and its vapor and the boundaries between two or multiple condensed phases. The effect of capillarity is modeled via curvature dependence of the chemical potential whose gradient gives rise to diffusion. The model is used to study thermal grooving on the surface of a polycrystalline body. Decaying oscillations of the surface profile during thermal grooving, postulated by Hillert long ago but reported only in few studies so far, are observed and discussed. Furthermore, annealing of multi-nanoclusters on a deformable free surface is investigated using the proposed model. 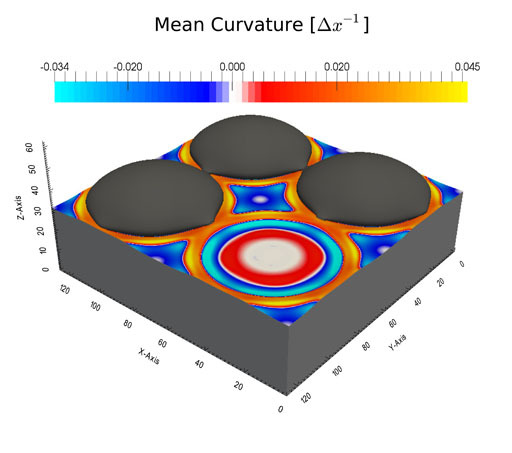 Results of these simulations suggest that the characteristic craterlike structure with an elevated perimeter, observed in recent experiments, is a transient nonequilibrium state during the annealing process.